Honestly, I wish someday I could pay you a visit to contemplate the scene myself! I hope that you just go wherever your heart takes you and come back together with the cold winter winds. I will still be here to enjoy this mild atmosphere filled with light fog, moderate wind, tiny wave and chill them with my profound emotion. 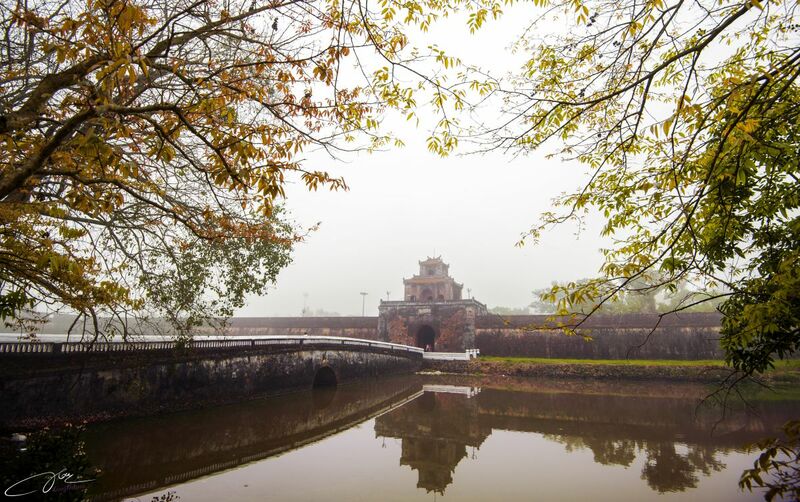 When I'm back, I promise to take you to the highest place in Hue to enjoy the panoramic view of the whole city with criss-crossing rivers and lushes. I haven't told you about my sensation when I stand quietly against the balcony to watch the city streets below, have I? I try to locate places that I have lived, have been or is visiting each day with a familiar yet exotic feel. I don't have carpets of yellow leaves where I live, only fallen brown leaves. There are days when I just spend a whole morning at the porch next to the winding lane near my home gazing at those yellow leaves. It's not the "me and myself" feeling as in the song by Thanh Tung, although it does remind me of the time I had the chance to talk with him when he was on tour in Hue a long time ago, of the way the seasoned artist sang "vắng em còn lại tôi với tôi/lá khô mùa này lại rơi" (without you it's just me and myself/dry leaves just keep falling), which made me silent before such great love one can have with another. What is ultimate in Hue will be found in Best of Hue. Let’s enjoy your journey! At noon, after dropping off my child at school, I did not know what to do. So, I wandered the streets. In the cool March air, drizzling rain gentle fell. It can be said that my knowledge of and my love for Hue come from my close Hue friends, who work in various fields such as museology, art, teaching and researching, antique collecting, etc. Autumn at my place does not have yellow falling leaves stretching endlessly to be captured and cheerfully sent via airdrop.